IBIS IS NAMED AFTER A BIRD. AS IT TURNS OUT, WE THINK IT WAS A GOOD MOVE NOT TO NAME THE COMPANY AFTER THE FOUNDER. CONSIDER WHAT HAPPENED TO THESE OTHER BRANDS THAT WERE NAMED AFTER THEIR FOUNDER. FORTUNATELY, IBIS IS NOT OWNED BY TREK OR ANY OTHER BIG COMPANY. WE’RE AN EMPLOYEE OWNED COMPANY, FIVE OF US WHO WORK HERE OWN 100% OF THE COMPANY. WE SERVE NO CORPORATE MASTER! ORBEA, AS ONE OF CYCLING'S OLDEST COMPANIES, IS ONE OF THE CUSTODIANS OF THE OLD TRADITIONS, OF THE ROOTS AND HERITAGE OF THE SPORT. OUR LONG HISTORY HAS LENT DEEP EXPERIENCE, WHERE WE'VE LEARNED FROM OUR MISTAKES AND CAPITALIZED ON OUR SUCCESS DECADES BEFORE THE COMPETITION. 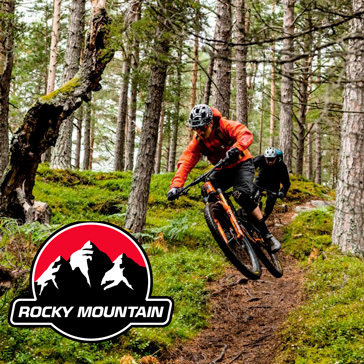 THE ROCKY MOUNTAIN DEVELOPMENT CENTER IS NESTLED AT THE FOOT OF THE VANCOUVER'S NORTH SHORE MOUNTAINS, HOME TO SOME OF THE WORLD'S MOST DIVERSE AND RUGGED TERRAIN. WE'VE BEEN DEVELOPING HIGH PERFORMANCE MOUNTAIN BIKES HERE SINCE 1981. FROM LOCAL TRAIL DAYS TO BACKCOUNTRY ADVENTURES, WE'RE ALL HERE FOR A REASON: WE LOVE MOUNTAIN BIKING. SANTA CRUZ BICYCLES WAS FOUNDED IN 1993 IN A SPACE THE SIZE OF A SINGLE CAR GARAGE IN THE SEABRIGHT CANNERY, IN SANTA CRUZ CALIFORNIA. OUR FIRST BIKE, THE TAZMON, WAS A SINGLE PIVOT DUAL SUSPENSION BIKE THAT RATTLED ESTABLISHED SENSIBILITIES AND HELPED DEFINE OUR THEN- ETHOS OF "SIMPLY ADVANCED." WE ARE RIDERS—THAT FACT HAS GUIDED OUR EVERY DECISION SINCE 1974. WHEN QUALITY TIRES WEREN'T AROUND, WE STROVE TO MAKE THE BEST. WHEN PEOPLE WANTED TO RIDE CRUISERS IN THE DIRT, WE MADE THE FIRST PRODUCTION MOUNTAIN BIKE. OVER THE YEARS THROUGH THE VARIOUS EVOLUTIONS OF YETI CYCLES, ONE THING REMAINS CONSTANT–RACING. AND NOT JUST RACING, BUT WINNING. GOING FASTER IS WHAT DRIVES US AT YETI. IT IS REFLECTED IN THE BIKES WE MAKE.